Matching systems: For a complete split system of maximum design efficiency, the outdoor unit is matched with a corresponding Airtemp indoor section that is either an air handler or a furnace with coil. SEER stands for Seasonal Energy Efficiency Ratio and is a measurement of the cooling efficiency of your heat pump. Specifications and ratings subject to change. Ask your contractor about current efficiencies and models available before purchase. Designed using galvanized steel with a polyester urethane coat finish. A 950 hour salt spray test shows the finish resists corrosion. Complete metal wrapper protects the internal components from yard hazards and extreme weather. Attractive, classic dark gray styling with contrasting wire discharge grille for premium product appearance. All-aluminum Micro-Channel coil for maximum airflow and hear transfer while providing superior resistance to corrosion. Reliable, energy-efficient scroll compressor technology for quieter operation. Engineered air discharge and high-efficiency fan motor for lower sound level system performance. For long lasting durability, the heavy duty fan motor is completely protected from rain and snow and requires no maintenance. Performance can increase up to 15 SEER when installed with a matched energy-efficient indoor air handler or furnace with coil. Up to 16 SEER and 9.0 HSPF energy efficiency offers exceptional performance, saving more energy, lowering utility bills. 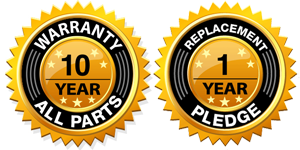 Certain matched systems qualify for ENERGY STAR ratings. 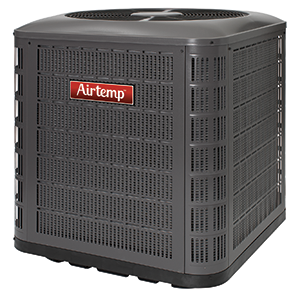 The best value for superior performance and total home comfort.